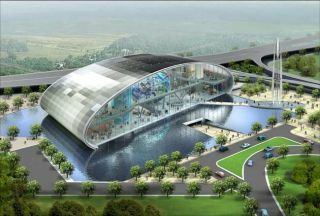 Spaceport Singapore is expected to provide suborbital spaceflights, parabolic aircraft flights and other space tourism experiences. SINGAPORE -- An effort to build a suborbital spaceport destination to cater to space-hungry tourists and families is pushing forward in Singapore, where aviation authorities are developing a homegrown set of regulations for commercial spaceflight. The Civil Aviation Authority of Singapore (CCAS) is laying the groundwork here for the rules to govern flights out of Spaceport Singapore, a planned $115 million (SGD $191 million) project to offer suborbital spaceflights and a host of other experiences to adventure-seeking tourists. "Commercial passenger suborbital spaceflight is very new to Singapore and for [the] CAAS," said Constanze Chia, assistant manager of corporate communications for Singapore's aviation authority, in a statement. "We are in the initial stage of formulating the appropriate set of regulations." Slated to open in 2009, Spaceport Singapore is the brainchild of a consortium of investors and the Virginia-based adventure tourism firm Space Adventures, which announced the project - alongside plans for a United Arab Emirates spaceport and a fleet of suborbital Explorer spacecraft- earlier this year. "We want to have different experiences available in as many different places as possible," said Eric Anderson, president and CEO for Space Adventures, in a telephone interview. "We're really hoping to just get out there and give people the opportunity to experience space." Space Adventures also offers rides aboard Russian MiG jet aircraft, a modified jet that simulates weightlessness during parabolic flights, and $20 million trips to the International Space Station (ISS). The firm has also announced plans for $100 million trips around the Moon. Japanese entrepreneur Daisuke Enomoto is set to ride a Russian Soyuz spacecraft to the ISS in September as the fourth tourist to the orbital laboratory. While orbital spaceflight has been the realm of astronauts and millionaires, Spaceport Singapore hopes to make access to suborbital space a more affordable experience. A five-day astronaut training regime for suborbital spaceflights aboard an Explorer vehicle. Flight simulators for jet and suborbital vehicles, as well as parachute and ejection seat trainers. A neutral buoyancy tank to allow customers a taste of spacewalk training. Aircraft flights to simulate weightlessness or the extreme speed of a high-performance jet. An interactive center where visitors can watch others undertake astronaut training activities, experience flight simulators and rides, sample Earthbound and astronaut food in a restaurant, or visit the ever-present gift shop. A Space Adventures Camp for children. Singapore tourism officials are hopeful that the planned spaceport will be both and economic and image boon for a nation-state that drew a record 8.94 million visitors in 2005. "We see Spaceport Singapore as having the potential to become an iconic attraction that would a appeal to a range of audiences," said Chang Chee Pey, director of cluster development, sightseeing and cruise for the Singapore Tourism Board, told SPACE.com in an e-mail interview. "We believe Spaceport Singapore will also enhance Singapore's international reputation for cutting edge technology and innovation." More than 500,000 annual visitors are expected at the planned spaceport during its first 30 months of operation, and the project itself could generate up to 5,000 direct or indirect jobs and about $2.3 billion (SGD $3.6 billion in economic benefits during its first decade, Chang said. "There's really only three countries in the world where you can take a spaceflight (the U.S., Russia and China) and they're all superpowers," said Lyon. "Singapore would be the first public spaceport located in a major city, rather than out in the desert or remote areas." In addition to the planned spaceport, work is already underway for two casino resorts to attract more tourists and revenue to Singapore. "Singapore is at a turning point in terms of tourism," Lyon said. The project also builds on Singapore's reputation as a port city, first for sea-bound ships berthing at its sheltered harbor, then later for its international airport, spaceport officials said. "They have one of the premiere seaports in the world and their airport is one of the best in the world as well," Anderson, chief of Space Adventures, said of Singapore. "The whole idea of a spaceport falls in line with their long term strategy."